Hot Rod City Las Vegas and Michael Dezer, owner of one of the world’s largest vehicle collections at The Miami Auto Museum, has announced the grand opening of the new Hollywood Car Museum Las Vegas. The recent partnering with Dezer, one of the world’s foremost car collectors has resulted in a 30,000 sq.-ft. (and still growing) Hollywood Cars Museum housing vehicles that have appeared in more than 100 films, TV shows and videos. The museum is now home to five James Bond vehicles including the Lotus Esprit Submarine Car driven by Roger Moore in the 1977 film, The Spy Who Loved Me, Batmobiles from both TV and film adaptations, Doc Hudson‘s Hornet from the animated Pixar film “Cars,“”Chitty Chitty Bang Bang” from the movie of the same name, the “Back to the Future” Delorean, the “Knight Rider” pursuit car (one of two in the world,) the bullet ridden car from the newest “Green Hornet” movie, “Herbie the Love Bug,” “Bonnie and Clyde‘s” death car from the movie, and vehicles from the first film in the “Fast and Furious” series, including one that was driven by the late Paul Walker. Visitors can also see cars from TV shows such as, “The A Team,” “Hardcastle and McCormick,” the Grand Torino from “Starsky and Hutch,” the coffin dragster from the “Munsters,” and the General Lee from “Dukes of Hazzard.” Other displays include tributes to three Flintstone cars including Fred’s family car, Fred’s sports car and Barney’s log car. There are also tributes to SpongeBob Squarepants, the Mater tow truck from the animated movie “Cars,” Bugs Bunny’s Rabbit Car and the Tasmanian Devil Car. 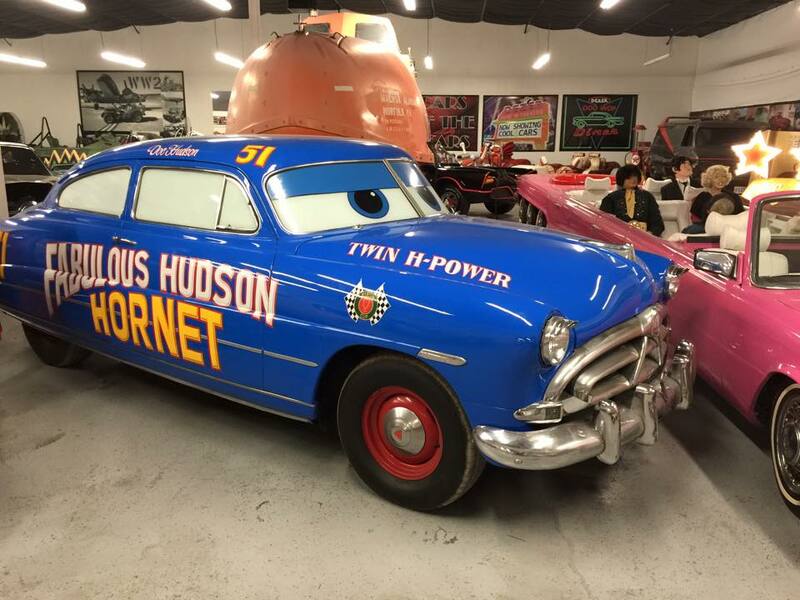 Other vehicles on display include the Alligator Car from “Death Race 200″ and the Pink Hudson Hornet from “Porky’s.” In all, the Hollywood Cars Museum in Las Vegas houses more than 100 cars worth a total of several million dollars.